Proximity and Displacement sensors are used to detect and measure the nearby objects without touching them physically. These sensors are extremely durable in adverse conditions such as high temperature and pressure; and therefore, find application in several areas such as automation, industrial manufacturing, and process industries. In addition, rising need for automated manufacturing in industrial areas is acting as a driver for the market growth. Furthermore, the changing lifestyle is leading to the need for innovative products with artificial intelligence. The proximity and displacement sensors play an important role in smart devices to provide accurate results. Hence the growing demand for smart devices is further aiding to the growth of proximity and displacement sensors market. 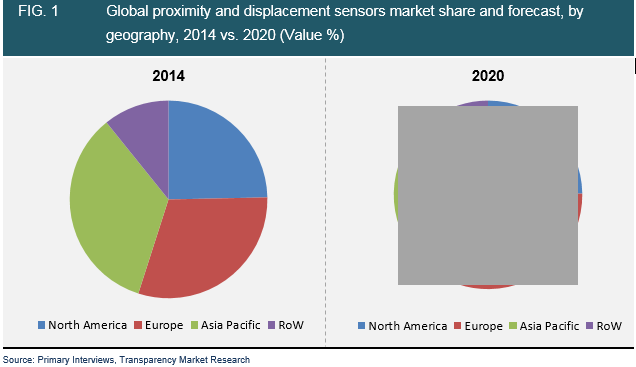 The global proximity and displacement sensors market was valued at USD 2.93 billion in 2013, growing at a CAGR of 2.8% from 2014 to 2020. Proximity and displacement sensors are used for various applications such as monitoring the distance between objects, metal detection, and automobile safety functions among others. In addition, these sensors find their application in several industries such as food and beverages, automotive, pharmaceutical and process industries among others. The proximity and displacement sensors find their application in every industry because of the importance of feedback based operations, which is fueling the growth of this market. The global proximity and displacement sensors market is segmented by regions into North America, Europe, Asia Pacific (APAC) and Rest of the World (RoW). The growth of proximity and displacement sensors market is primarily driven by the increasing demand for automated functionalities in manufacturing industries such as food and beverages, pharmaceutical and process industries among others. In addition, the lowering cost of components required to manufacture these sensors have further contributed to the growth of proximity and displacement sensors market significantly. In 2014, Asia Pacific (APAC) led the proximity and displacement sensors market and the region is expected to maintain its dominance throughout the forecast period. The integration of proximity and displacement sensors in machineries is acting as the driver for this market. Furthermore, the most of the leading players such as Omron Corporation, Sharp Corporation and Panasonic among others have their manufacturing unit in this region. Europe followed Asia Pacific accounting for more than 30% of the global market revenue share. However, North America and Rest of the worlds (RoW) are expected to see steady growth as North America is a saturated market where as RoW mostly consists of third world countries with less presence of manufacturing industries. The global proximity and displacement sensors market by sensor types is categorized into inductive sensors, photoelectric sensors, capacitive sensors, magnetic sensors, ultrasonic sensors, LVDT sensors and others. The photoelectric sensors had the highest market revenue share in 2014 and are expected to continue its dominance during the forecast period. Photoelectric sensors are extensively used in industrial manufacturing. In addition, these sensors use light transmitter to detect the presence, absence or distance of an object which is considered to highly efficient and durable. Moreover, these sensors are also used for remote sensing when the environment is very hostile or the space is restricted. Based on the end user industries, the proximity and displacement sensors market is segmented into automotive, food and beverages, process industries and pharmaceutical among others. Automotive industry has the highest market revenue share contributing more than 20% of the global market followed by food and beverages. Automotive industry has the largest application of these sensors because of the rising demand for safety in automobiles and automated machineries in factories. In addition, these sensors are resistant of chemicals and can withstand high temperature and pressure conditions. The process industries have been analyzed to be the fastest growing industry which uses proximity and displacement sensors. Proximity and displacement sensors are used to detect the presence of nearby objects without touching them physically. These sensors are embedded in machineries for machine vibration monitoring. This helps in measurement of variation in the distance between the shaft and it support bearing. In addition, these sensors are also used in smart devices such as smartphones and tablets to detect accidental touch screen taps when held to the ear for calls. There sensors are in demand due to the increasing demand for automated machineries in various industries such as automotive, food and beverages and process industries among others. In addition, the price of these sensors are falling drastically which is acting as a driver of this market. The global proximity and displacement sensors market is expected to witness significant growth during the forecast period. This is due to increasing demand for automation and the importance of feedback based production in all the industries. In addition, the growing awareness of safety in automobiles is also driving the market. Presently, the automotive industry holds the majority of the market and is expected to dominate the market during the forecast period. In addition, the introduction of unique safety features such as parking assist, automatic cruise control, side assist and lane assist in automobile is giving a boost to the use of proximity and displacement sensors market. Moreover, the use of these sensors in the process industries is also growing rapidly. Furthermore, the increasing concern for healthy living is increasing the demand of wearable technology which also uses proximity and displacement sensors. Adoption of high end technologies and the concept of nanotechnology is also creating new opportunities for the proximity and displacement sensors manufacturers globally. However, the limitation in sensing capabilities is acting as a restraint for the market. Regionally, Asia Pacific has the highest penetration rate for proximity and displacement sensors due to the presence of developing nations like India and China. This market research study analyzes the proximity and displacement sensors market on a global level, and provides estimates in terms of revenue (USD million) from 2014 to 2020. It recognizes the drivers and restraints affecting the industry and analyzes their impact over the forecast period. Moreover, it identifies the significant opportunities for market growth in the coming years. The report segments the market on the basis of geography as North America, Europe, Asia-Pacific (APAC), and Rest of the World (RoW), and these have been estimated in terms of revenue (USD billion). In addition, the report segments the market based on the product type, which include inductive sensors, photoelectric sensors, capacitive sensors, magnetic sensors, ultrasonic sensors, LVDT sensors and others. The proximity and displacement sensors are most widely used in automotive industries. It also segments the market on the basis of end user industries as automotive, food and beverages, process industries, pharmaceutical, industrial manufacturing and others. All these segments have also been estimated on the basis of geography in terms of revenue (USD million). For better understanding of the proximity and displacement sensors market, we have given a detailed analysis of the value chain. A detailed Porter’s five forces analysis has been given for a better understanding of the intensity of the competition present in the market. Furthermore, the study comprises a market attractiveness analysis, where the applications are benchmarked based on their market scope, growth rate and general attractiveness. The report provides company market share analysis of various industry participants. The key players have also been profiled on the basis of company overview, financial overview, business strategies, and the recent developments in the field of proximity and displacement sensors. Major market participants profiled in this report include OMRON Corporation, Schneider Electric, Eaton Corporation Plc and IFM Electronics GmbH, among others.